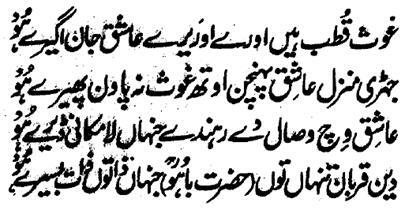 Hazrat Sultan Bahu Rahmatu-Allahe Ta-aala Alaihe says that 'the Destination of the Aashiqeen is beyond the Destination of the Ghaus and Qutub as the Station of the Aashiqeen is the Lahoot Lamakaan whereas the Station of the Ghaus and Qutub is in the Arsh and Kursi and the Seven Heavens. Thus, the Ghaus and Qutub are unblessed with the Destination of the Aashiqeen. Those people, who become brightened by the Noor of the Essence of Allah Almighty, the entire bounties of the world and the Hereafter and the wealth of Deen and Dunya (World) love them ready to sacrifice for them and both of these demand them. That person, who intended for Dunya (World), the Dunya (World), is for him; he, who intended for the Uqba, for him is the Uqba and he, who intended for Lord , everything is for him!